86% of internet users have taken steps online to remove or mask their digital footprints—ranging from clearing cookies to encrypting their email, from avoiding using their name to using virtual networks that mask their internet protocol (IP) address. Still, 59% of internet users do not believe it is possible to be completely anonymous online, while 37% of them believe it is possible. 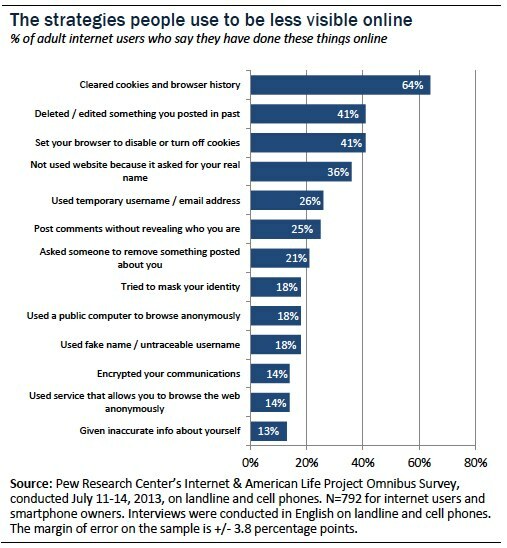 A section of the survey looking at various security-related issues finds that notable numbers of internet users say they have experienced problems because others stole their personal information or otherwise took advantage of their visibility online—including hijacked email and social media accounts, stolen information such as Social Security numbers or credit card information, stalking or harassment, loss of reputation, or victimization by scammers. 13% of internet users have experienced trouble in a relationship between them and a family member or a friend because of something the user posted online. 12% of internet users have been stalked or harassed online. 11% of internet users have had important personal information stolen such as their Social Security Number, credit card, or bank account information. 6% of internet users have been the victim of an online scam and lost money. 6% of internet users have had their reputation damaged because of something that happened online. 4% of internet users have been led into physical danger because of something that happened online. 1% of internet users have lost a job opportunity or educational opportunity because of something they posted online or someone posted about them. Some 68% of internet users believe current laws are not good enough in protecting people’s privacy online and 24% believe current laws provide reasonable protections. 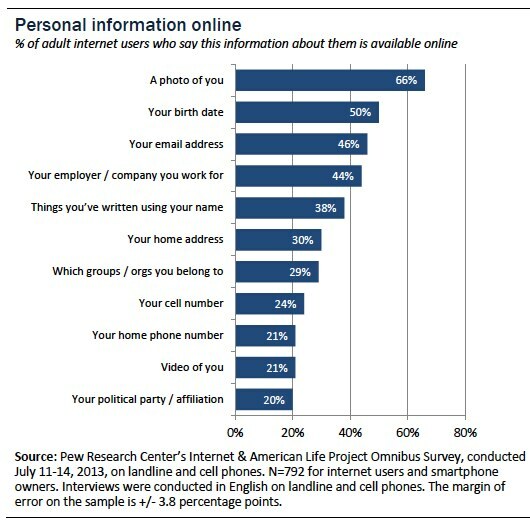 Most internet users know that key pieces of personal information about them are available online—such as photos and videos of them, their email addresses, birth dates, phone numbers, home addresses, and the groups to which they belong. And growing numbers of internet users (50%) say they are worried about the amount of personal information about them that is online—a figure that has jumped from 33% who expressed such worry in 2009. 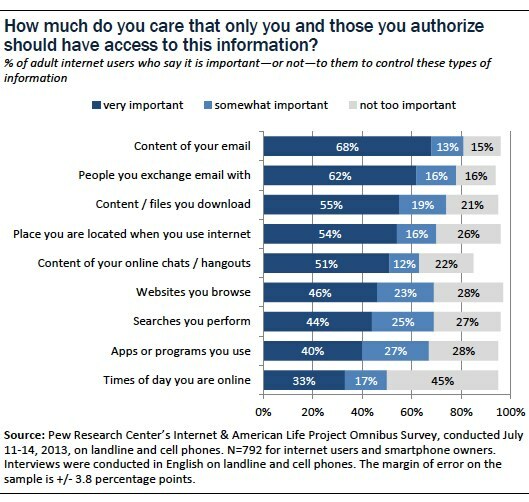 People would like control over their information, saying in many cases it is very important to them that only they or the people they authorize should be given access to such things as the content of their emails, the people to whom they are sending emails, the place where they are when they are online, and the content of the files they download. This survey by the Pew Research Center’s Internet Project was underwritten by Carnegie Mellon University. The findings in this report are based on data from telephone interviews conducted by Princeton Survey Research Associates International from July 11-14, among a sample of 1,002 adults ages 18 and older. Telephone interviews were conducted in English by landline and cell phone. For results based on the total sample, one can say with 95% confidence that the error attributable to sampling is plus or minus 3.4 percentage points and for the results from 792 internet and smartphone users in the sample, the margin of error is 3.8 percentage points. More information is available in the Methods section at the end of this report. 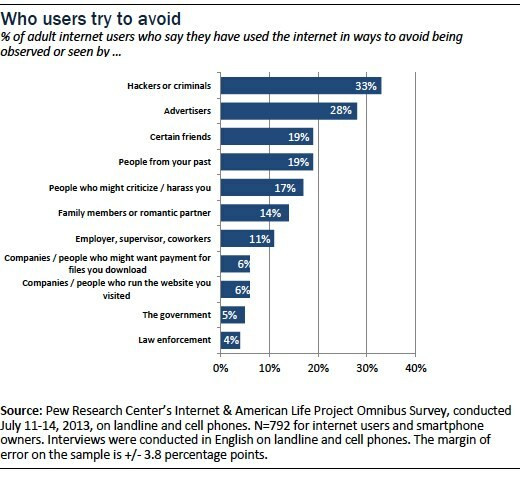 The chart below shows the variety of ways that internet users have tried to avoid being observed online. Beyond their general hope that they can go online anonymously, the majority of internet users have tried to avoid observation by other people, groups, companies, and government agencies. Hackers, criminals and advertisers are at the top of the list of groups people wish to avoid. Users know that there is a considerable amount of personal information about them available online. Among the list of items queried, photos were the most commonly reported content posted online; 66% of internet users reported that an image of them was available online. And half (50%) say that their birth date is available. Another set of questions focused on the kinds of “data exhaust” that is generated as a result of everyday forms of online communications, web surfing and application use. Respondents were asked how much they cared “that only you and those you authorize should have access” to certain kinds of behavioral data and communications content and there was notable variance in the answers. The content of email messages and the people with whom one communicates via email are considerably more sensitive pieces of information when compared with other online activities and associated data trails.